This idea came to me on a whim, after seeing The Nourished Caveman’s salmon and avocado boats! 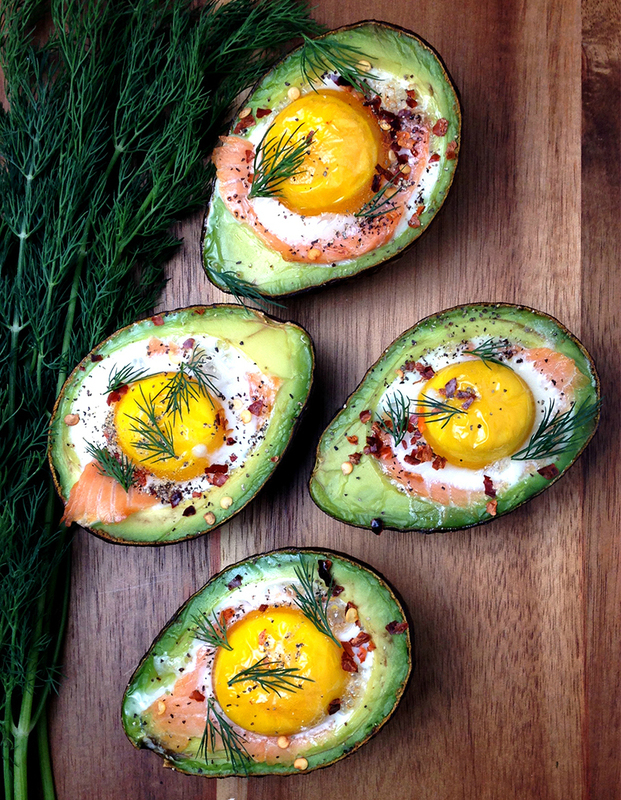 But I love eggs, so I took it in the direction of eggs baked in avocado with smoked salmon. I whipped up my dead simple version, and it couldn’t be richer, creamier or tastier. I almost feel silly posting a recipe, because all you do is halve the avocados, carve them out a bit (definitely spoon the excess avocado straight into your mouth, right? ), line them with smoked salmon, dollop in the egg and bake until firm. Garnish with chili flakes and dill, then eat warm. Done! One small confession: this is the first time I’ve eaten avocado warm, but I like it. I can’t decide if next time I’ll make some coconut flour buns to smear this on, or enjoy these baked eggs in avocado straight out of the avocado skin again. One note about the yolks getting overcooked by the time the whites are firm, listen up. If this is an issue for you, cook the egg whites and yolks separately. That’s right, separately. Combine the egg whites in a bowl, season with salt and pepper. After hollowing out the avocado, spoon in the egg whites, being careful not to fill to overflowing (since the egg yolk will be added later). When the whites are almost completely set, that’s when you want to delicately slide the yolks right on top… voila! The yolks are nice and soft after 5-10 minutes more of baking and the whites are set, too. Problem solved, baked eggs in avocado flawlessly. 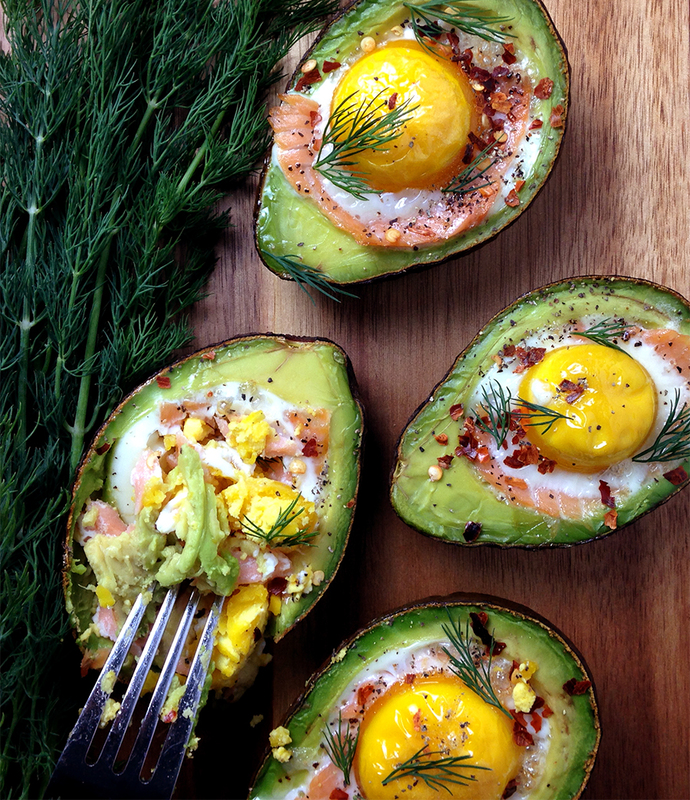 These baked eggs in avocado with smoked salmon are packed with healthy fats for a filling breakfast or snack. What do I do with 2 halves already cooked? Too full to eat any more right now. ??? Read the instruction again. Such a good idea! I’ve seen the egg + avocado combo but adding the smoked salmon makes it so much better. I was worried the taste would be over-the-top if I combined all three, but nope! Just yummy. Skip the chili flakes, and sprinkle with red wine vinegar for zing! I am going to try with bacon bits on top. I hate smoked salmon, what else can I use? Canned salmon would also work! I am pregnant right now and always looking for ways to get in more healthy fats. This is a recipe I am FOR SURE going to try. Thanks! This is going to be great for ya, then. So filling and tasty, full of Omega 3! Your comment seems quite correct!! I can’t find 1 SINGLE REVIEW that even begins to give ANY idea of how this dish actually TASTES!! Almost every comment is how it looks. I’m FAR more interested in how good a dish is, how much people liked how it TASTED, what they liked, what they might change etc. I’m TRYING to choose recipes based on how much I might enjoy EATING them, NOT turning them into photo subjects. I thought this website was about FOOD not photography or plate presentation potential for 5 star restaurants!! NOR could I find any way to post my comment directly to the Author of this recipe!! Just wanted to say how VERY right you turned out to be!!! Hi! If you’d like to comment directly to me, just scroll all the way down to the bottom of the page and leave a message in the comment box. But obviously, I see and monitor replies to other people also. I really love what you did with the recipe! Looks amazing and I will have it for breakfast tomorrow! YUMMM! Wow, these are so pretty. I think they would also be great with coconut flour buns. I will definitely have to try these. Dang these look AMAZING! I’ve done eggs in avocados before but NOT with smoked salmon. Sound delish! Thanks, Tina! They’re so yummy. Mine was rubbery on top. What did I do wrong? Holy Moly! I don’t even know what else to say. These look insane! Definitely making them soon! My modification to keep the avocados cool, assemble the avocados with the salmon, Poach the eggs, place poached eggs in the avocados with the salmon, top with salt, dill, red and black pepper as you like. no piney taste with cool avocados. Hmmmm can’t say I’ve ever experienced a piney taste with baked avocados, but your version sounds delicious! I’ll try poaching the eggs, and leave the avocado cool. Argh, really? Sorry to hear it. I might try the poaching the eggs first. Mine were not done in 20 minutes when I cooked them in the avocados’. I hate undone egg white. I cooked them longer, but the yolk got too done and browned on top…….any suggestions?? How do you keep the eggs from falling out of the avocado? How much before can these be prepared in advance? As these would be great for a dinner part with friends! Saw this on Elite Daily. I’m HERE for this! We baked these over the holidays without the salmon, cant wait to try it with the salmon. Great recipe and impressive presentation for a brunch. My Boss saw a picture on the newspaper The Times, now he has asked me to look for the recipe (and here I was, looks yummy); trying it tomorrow for Friday night “Shabbath”… hoping for the best. Thanks Grok Grub, looking forward to trying more of your recipes… i loooooove cooking!!! Haha, this recipe is the type that keeps on giving… even years later. Nutritious. I really want to try this! These are stunning! We are going to try them tomorrow morning! Thanks for sharing! I have not seen any feedback when actually having tried the recipe. My experience with trying to cook eggs in the oven, no matter what “vehicle”used, has been pretty discouraging. It takes a really long time to cook the eggs and, when placed in an avocado, it probably will overcook the avocado. May cook it too long for your liking. Impossible to tell without trying it. These are wonderful quick and health low carb meals on the go!! This looks fabulous, but because it’s a fruit, avocado should NEVER be heated; heat destroys its healthy properties (read “Fit for Life,” written in the 1980’s by Marilyn Diamond and Harvey Diamond). I might make this, but not with the avocado warmed at all; I’d cook the egg, and I’d heat the tuna (salmon allergy) in the residual warmth of the pan, but I won’t heat the avocado. Thanks for the tip, the science is from the 80’s and hasn’t been debunked yet? The cynic in me suspects science has been driven by money for the past century or longer. Certainly as far back as the 80’s. But! By all means, keep your avos cool. Making these this weekend for my work out peeps! Can’t wait to try them with the smoked salmon. Thanks for the recipe. Wonderful! Let me know what they think. Hi Grok, I love this recipe! It’s my go-to breakfast especially on those days that I want to give myself an extra boost of energy. Especially for my husband and daughter who are gluten-free and Paleo, this breakfast has been a home run. Since I have a lot of readers who eat Paleo diet like us and also weight loss minded women constantly on a look out for a great low-carb breakfast, I shared your recipe on my site here http://fitwirr.com/health/tips/paleo-recipes in hope of being a great resource to them. Thank you for the great recipe and sharing it on your site. Thank you! My site is now Fresh Planet Flavor, however. Woohoo. I love each one of this ingredients separately but never tried this combo. I would eat this at any meal of the day, not only breakfast. The baked Avocado eggs are wonderful. It is just me, so I cut a large avocado in half and added the egg, topped with smoked paprika and a slice of bacon cut into 3 small pieces on top. I didn’t have any salmon. I cooked it in my toaster oven for 20 minutes on 425 degrees. Came out perfectly and so delicious. I’m hooked and will eat this more often because I love avocado. Thanks for the simple and yummy breakfast recipe. This makes me so hungry. Will try this as soon as money touches my hands. Thanks for the recipe!